The Art Nouveau Liberty & Co Style, founded by Arthur Lasenby Liberty and its premier designer Archibald Knox. The art nouveau style was itself highly influential but few people can claim to have been quite so influential in the history of modern design as Arthur Lasenby Liberty. From a small shop, opened in 1875 on the corner of Regent Street, Liberty was to popularise an idiom now known and revered world wide simply as "Liberty style". Originally importing exotic household goods from the east, within 25 years liberty was commissioning work from some of the finest British Avant-garde designers and retailing in a way that made it accessible to a much larger public. During the 1880’s and 1890’s Arthur Lasenby Liberty had seen the rise of many workers Guilds. These were organisations based on the tenets and principals of the medieval artisan Guilds. The likes of the Guild of Handicrafts headed by Charles Robert Ashbee and the Birmingham Guild of Handicrafts under the influence of Arthur Dixon had produced works of tremendous quality and beauty. However, whilst embracing a very refined aesthetic, the Guilds were victims of their own high levels of workmanship. The high man-hours and resulting costs it took to produce their handcrafted pieces ultimately, and somewhat ironically, made their produce very elitist. Like William Morris they relied upon a relatively small but wealthy patronage and struggled for any longevity. In it’s early days Liberty & Co too had enjoyed the patronage of luminaries such as Burne-Jones, Dante Gabriel Rossetti, Whistler and Lord Leighton but Arthur Liberty was aware of the precarious nature of such dependency. Liberty was nothing if not a shrewd businessman and realised that if he was to succeed in promoting design to the public at large he would also have to address the issue of high production costs. The Art Nouveau Liberty & Co style, its suppliers, products and Archibald Knox. Liberty introduced continental Art Nouveau to London shoppers, adding chairs by Richard Riemerschmid and ceramics by the Hungarian firm Zsolnay to his offerings. 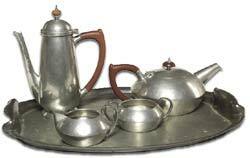 Among the many lines imported by Liberty & Co were Kayserzinn and WMF pewter from Germany. Both of these companies had successfully married cheap production costs with artistic design to produce sophisticated metalware for a mass market. Unlike the work of the Guilds their products were created using the automated techniques of spinning and die-casting. In 1899, Inspired by their success and driven by manager John Llewellyn, Liberty & Co went into production. In that same year they exhibited two small collections of silver ware and jewellery bearing their own assay mark, first at the shop and then at the Arts and Crafts exhibition. Their "Cymric" range had been born. The machine produced silver and jewellery was hand finished and often decorated with a variety of semi precious stones, abalone and of course enamel, giving it the appearance of a luxury product. It was three years before the less expensive and more accessible "Tudric" range was introduced. 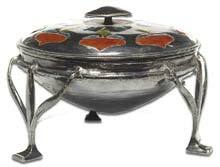 This was made from pewter rather than silver making it available to a wider public. From 1902 a large range of designs were produced in conjunction with the silversmiths W. H. Haseler with glass liners and decanter bodies being provided by James Powell and sons of Whitefriars and glass from James Couper & Sons of Glasgow’s "Clutha" range. Both Tudric and Cymric were produced right into the 1930’s but the early years, particularly between 1902 and 1905, saw the most accomplished and daring designs. It is fair to say that the reputation of both Cymric and Tudric is largely due to the artistry and flair of one man – Archibald Knox. Archibald Knox, was born on the Isle of Man and trained with Christopher Dresser and M H Baillie Scott. A strong sense of his Celtic ancestry combined with a powerful modernist streak and an unerring sense of proportion led to some of the most important designs of the Arts & Crafts movement. His work ranged from very pared down modernist work with minimal ornament, relying largely on form and line, to highly decorated organic pieces with breath-taking intricacy and complexity. Pieces heavily influenced by his Celtic heritage and decorated with stylised knots would not look out of place in the Book of Kells. Although, Archibald Knox is undoubtedly the most celebrated of Liberty & Co’s designers, other Liberty artists made valuable contributions. Among these artists and designers are such great names as Jessie M King, Mary Watts, Oliver Baker, Bernard Cuzner and Fleetwood Varley. Despite this pantheon of names, and not wanting to divert attention from his own brand identity, Arthur Liberty adopted a policy of not promoting the names of the designers he used (with the notable exception of Mary Watts). As a result Liberty became the embodiment of modern innovative design. This combination of clever marketing combined with lower production costs gave Liberty & Co a substantial commercial edge. Whilst attracting derision from competitors such as Robert Ashbee, (he largely blamed Liberty & Co’s pandering to profit for the failure of The Guild of Handicrafts), it was the cornerstone of their success. It is believed that the collaboration between Knox and the shop concluded in 1912 and in many ways this marked the end of Liberty & Co’s place at the forefront of design. Liberty & Co. continued producing Tudric and Cymric into the 1930s but many of the new models were in-house adaptations of earlier designs that lacked the finesse of the originals. Towards the nineteen twenties public tastes moved away from Arts & Crafts and rather than trying to innovate, Liberty’s metalware became simpler and more traditional. In 1917 Arthur Lasenby Liberty died and with him went the company’s pioneering spirit. It is surely a fitting tribute to the great man that a century after the release of his silver and pewter range, the Cymric and Tudric wares are prized more highly now than they ever have been.